Black and white negative depicting a photograph of the residence of Frank Puckrin. The house was photographed from the side with a view of the turret and two chimneys. A truck is parked in the driveway and a shed or garage can be seen in the left side of the image. There is a swing set at the side of the house. 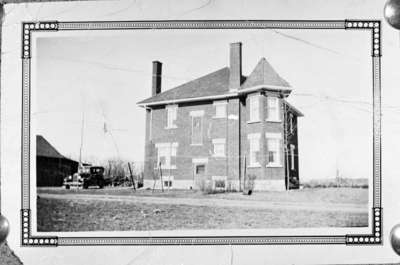 This house was built around 1912-1914 on lot 29 of Concession 4 (Taunton Road) in Whitby Township. It was located on the north side of Taunton Road at Cochrane Street.